Tomorrow, CBS Sports will begin its own broadcasts of the US Open tennis tournament, culminating with the men’s singles championship on Monday Sept. 8. It’s the beginning of the end — ESPN will take over the rights and production duties next year — but that has not prevented the CBS Sports team from ensuring that its role at the center of the production action is anything but top notch. This year, coverage of seven televised courts is produced out of a large, double-stacked cabin and a number of remote-production units. Those include F&F’s GTX17, which is handling CBS and ESPN production duties, and GTX16, responsible for Tennis Channel coverage. NEP’s Skyline, SS11, ST27, SS16, and ST28 are covering courts 3, 5, 17, 11, and 13, respectively (ST27 is also sharing two mix effects of the SS11 production switcher). After today, courts 11 and 13 will no longer be televised so that those trucks can service the needs of the CBS Sports Network, which is back on-air this weekend. From a technical standpoint, the addition of F&F GTX17 is the biggest change from last year. The result is a better working environment and a unit that, when CBS coverage of SEC football begins, will bring an NFL A-game feel to the whole show. At the Open, AVS is once again providing RF audio and HD video via two HD RF camera systems (one with a Sony camera head, the other with an Ikegami head). In addition, fixed-wing aerial coverage will provide signals received by a roof-based receiver and transmitted to the compound via a new fiber camera run. 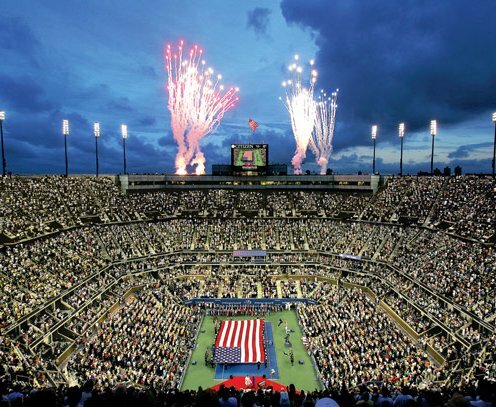 In terms of camera specifics, coverage from Arthur Ashe Stadium will feature 14 Sony and two Ikegami cameras and a Grass Valley super-slo-mo camera that records at six times regular speed. Armstrong will have 14 Ikegami cameras; court 3, 10 Sony cameras; court 5, 10 Ikegami cameras; and court 11, 12 Sony cameras.